Pop the CD in the CD player - then press play! Do you feel lucky, do you feel really lucky ? There are 6 chambers, but 1 bullet - has it got your name on it - or is it blank ? 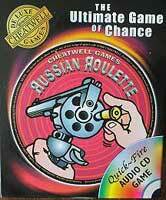 Bet thousands, throw 10 dice and wait for the chamber to spin, whirrrr ..... click ... no bullet! Quick, throw again, only 6's count and you've got to score more than your opponents - is there time before the gun goes off ? Instant fun at the press of a button - an addictive game!